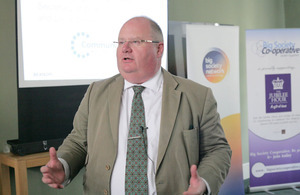 Communities Secretary Eric Pickles has committed 60 minutes of his time to volunteering in a local charity shop in his constituency. (Photo courtesy of the Big Society Network). At the Jubilee Hour launch event at Somerset House last night (29 May 2012), Mr Pickles made his pledge as part of the biggest mobilisation of volunteer effort since World War 2. Jubilee Hour calls on people across the UK to donate 60 minutes of their time to help their local community, to honour the Queen’s 60 years of service. “I am going to go back to my roots and will be giving at least an hour to 1 of my local charity shops. “The Jubilee Hour will see people and organisations across the country doing hands-on work in their communities and supporting charities important to them. Individuals, organisations and businesses are encouraged to volunteer their time to take part in civic, charitable or local community activities. Participants can volunteer individually or as part of a company, organisation or school to help the community through a simple act of good will - from picking up litter in a park to organising an event at a care home. More information can be found on the Jubilee Hour website.